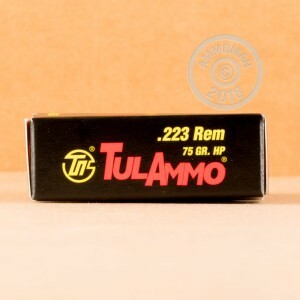 This .223 Remington ammunition from Tula is a bit different from your typical range fodder in its use of a heavy 75 grain hollow point bullet. While not as accurate as a Sierra MatchKing or other true match projectile, these rounds can make a great stand-in for their more expensive cousins for high volume practice. The weight of the bullet results in better stability and resistance to crosswinds. Tula ammo is loaded in Russia using non-corrosive Berdan primers and non-reloadable steel cases. The steel is polymer-coated for reliable feeding and ejection. 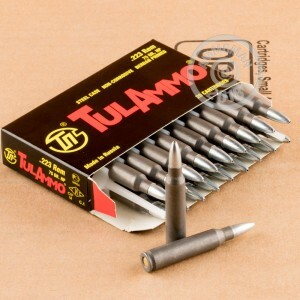 These rounds are a great way to save, and there's a way to save even more: place an order for $99 or more at AmmoMan.com and shipping is free! Love it! No jams, used in Colt 1/7 & S&W 1/8 twist AR15s both ate it up. I was very fortunate to get case of 1000 for $270.00 free shipping! You're not going to get a better deal on 75 grain ammo to use for range. It's Tula, who wouldn't clean their rifle afterwards. Will buy again when available.